Today we begin on the sad journey to say farewell and thank you to the most travelled spacecraft in history - Space Shuttle Discovery. This morning, it made it's final takeoff which will ultimately end its nearly 27 year old story 15 days later. Discovery first lifted off not long before I was born in 1984. 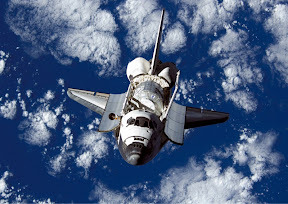 Six years later, it went into space on mission STS-31 to bring one of the most fantastic objects ever invented by man to occupy the heavens - the Hubble Space Telescope. Even though the telescope was fraught with problems in its infancy, what Discovery delivered not only gave us amazing images of the universe we live in, calculate the age of it all, but it gave us an amazing new perspective on life - we are so small and insignificant in the grand scheme of things, why all the hate, why all the misery? Thank you Discovery, for you have improved our world and our understanding of the world we live in and the greater universe out there. Maybe, one day we'll meet at the Smithsonian.